Defense Secretary Mattis has signed orders for the additional troops to Afghanistan, and they will start moving in the next few days, according to CBS News' David Martin. Speaking with reporters at the Pentagon Thursday, he wouldn't give the exact number but said the troops deployed will include advisers and fire support, that is, artillery. Mattis said he won't disclose the number of troops until after he testifies before Congress on Sept. 6. But that number is 3,800, and that about half of them will come from the 82nd Airborne. Mattis also strongly disputed reporting that he was at odds with President Trump on options for dealing with North Korea. "If I say six and the President says half a dozen, they are going to say we disagree," he said. Before he answered a question about the tweet Wednesday, he had even read what the president said in the tweet: "The U.S. has been talking to North Korea, and paying them extortion money, for 25 years. Talking is not the answer!" When Mattis was asked about the president's words Thursday, he seemed to disagree with the president, asserting,"We're never out of diplomatic solutions." But Mattis insisted, "There was no contradiction at all." He explained, "I agree with the president that we should not be talking to them when they are firing missiles over Japan." He went on to suggest that his meaning was broader. 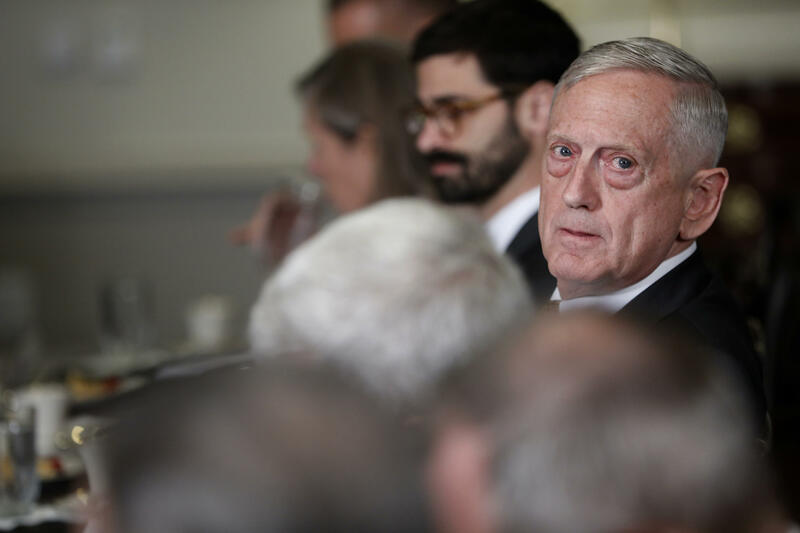 When Mattis said that the U.S. was not out of diplomatic options, he said he was referring to the whole range of diplomatic activity – including economic sanctions aimed at the North Koreans. Mattis also brought up another instance which he said showed the press manufacturing a disagreement between him and the president. He had given an impromptu talk to troops in Jordan shortly after the violence in Charlottesville, in which he told them he had to hold the line until people back home came to their senses and ended the divisiveness. He recalled that he had gotten up at 3:30 a.m. to watch the President's speech announcing the Afghan strategy. That speech began with a lot of rhetoric calling on people to come together, and he said he was simply trying to repeat that same theme to the troops. "I can take the president's themes and use them, and I'm accused of disagreeing with him," Mattis complained. "It frustrates me when I see something (press coverage) so out of touch with reality." Asked about whether he or the other generals (John Kelly or H.R. McMaster) ever thought of resigning he said "when the president of the United States asks you to do something,...we all have an obligation to serve." Mattis added that in his interview for defense secretary with Mr. Trump, "I disagreed with him on three things – NATO, torture and something else -- and he hired me anyway. This is not a man who is immune to being persuaded."